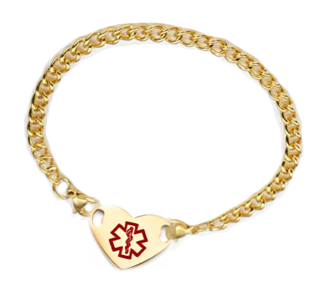 Stainless steel and 18K gold plated heart medical ID curb chain ankle bracelet anklet with large medical alert symbol. Plaque may be engraved on back. Plaque measures approximately 1 x 3/4 inch. Choice of 9 inch (22.86 cm) or 10 inch (25.4 cm) anklet (length includes plaque). Chain width is 4.2mm and attaches to plaque with lobster clasp.